Aaron Foster, an ex-gang member with Faith in the Valley Fresno who is trying to stop gun violence in Fresno. Aaron Foster stands outside Wayne's Liquor store on East California Avenue. There’s a park across the street buzzing with people, a taqueria around the corner, and a library a few blocks away. Foster has lived in this neighborhood since he was 16 years old. Before that, he visited every summer. He says this area is a place where people can coexist without problems; it’s not gang territory. 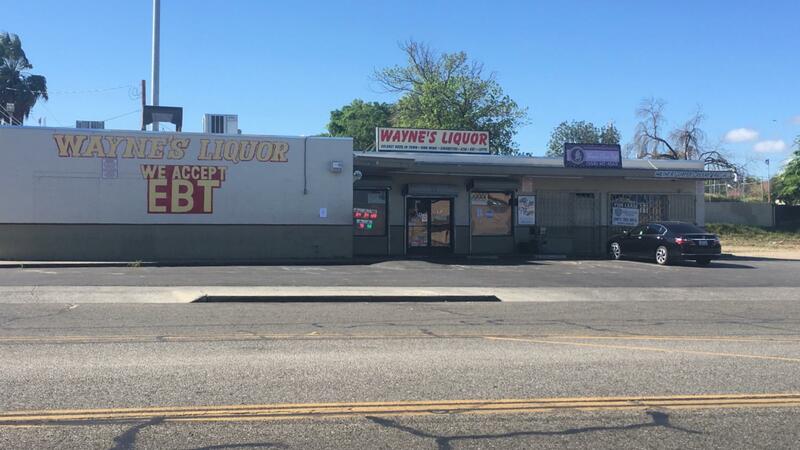 Wayne's Liquor Store on East California Avenue in Southwest Fresno. After losing two children to gun violence, Foster says he’s been on a mission to stop shootings from occurring in Fresno. He says his 21-year-old son and 18-year-old daughter were shot in the back of the head on Memorial Day weekend four years apart. 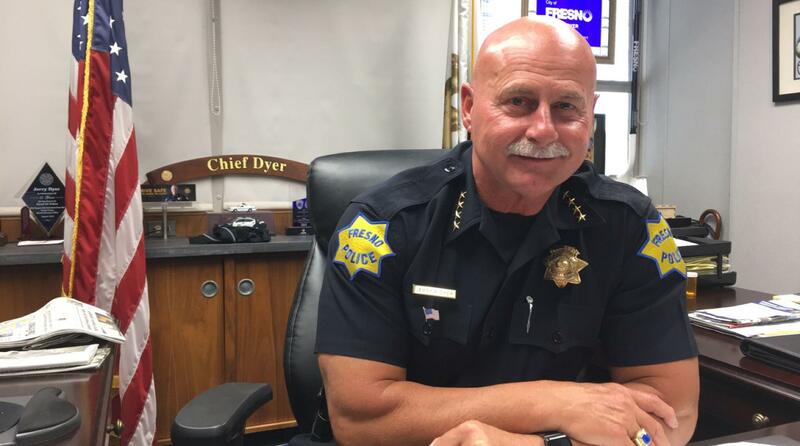 On average 75 to 80 percent of homicides in Fresno are gun related, according to Fresno Police Chief Jerry Dyer. He says 70 to 75 percent of those shootings involve gangs. In 2017, 41 out of the 56 murders in the city involved guns and gang members were involved in 30 of those cases, police data shows. Last year, 26 out of the 32 murders involved guns and 21 of those involved a gang member. Two years ago Foster reached out to Advance Peace, a nonprofit that has a controversial approach at reducing gun violence. Ever since then he’s been trying to get them to come to Fresno. Advance Peace works with people who are most likely to be, or already are, involved in gun violence. Those who enroll in the 18-month Peacemaker Fellowship receive mentoring, behavioral therapy, life skills training, and internships. Every fellow is assigned a case manager and a so-called life map that outlines their goals. Boggan started this fellowship model in 2010 at the Office of Neighborhood Safety, or ONS, in Richmond, a Bay Area city that was notorious for shootings. From 2010 to 2016, 84 people went through the fellowship, Boggan says, and 94 percent are still alive. “Eighty-three percent of them haven’t been injured by a firearm today and 77 percent of those individuals have not been named as a suspect in a new firearm crime since becoming a fellow,” he says. After fellows hit their six-month mark, they can get paid up to $1,000 a month based on their progress and achievements. Some critics see that as a bribe, paying people not to shoot each other. The program manager for ONS, Sam Vaughn, says that criticism is misleading. The difference is ONS and Advance Peace work with a group of people who live and operate in the shadows around institutional racism, Vaughn says. Some fellows have only known rejection for their entire lives, he says, whether it be from their parents, teachers, or employers. “If people say their lives would be the same, they are fooling themselves,” Vaughn says. “When we travel outside of California or outside of the United States of America, which we do several times a year, the only difference is they have to be willing to travel with someone they have a challenge with, someone they would consider their enemy so to speak,” Boggan says. Advance Peace asks cities for a five-year commitment that costs $3 million. Those first five years Advance Peace pays for half of the program, making it $300,000 a year for cities. After that, the city needs to pay for the program in full. Last year, Stockton and Sacramento adopted Advance Peace. Boggan says in both cities the mayors were the main supporters of the program. For this to happen in Fresno, city budget funds need to be allocated for it first. Then four council members need to vote in favor of it. At least one council member says he’s open to supporting Advance Peace. “I’m definitely open to supporting it,” says District 3 Councilman Miguel Arias, which includes parts of Southwest Fresno. He says he’s been to a couple of meetings with community members who support Advance Peace coming to Fresno. Arias says supporters need to sit down with the mayor to see if he’s willing to include funding for Advance Peace in his proposed budget. With the mayor's support, he says the program could have “sufficient” council support. Faith in the Valley Fresno, Fresno Boys and Men of Color, and Stop the Violence are all local groups that support of Advance Peace. “If they’re (Advance Peace supporters) unable to do that, then we’ll have to see whether from the council we can make that proposal,” Arias adds. The mayor will release his proposed budget next month, the city's spokesperson Mark Standriff says. The final budget needs to be approved by June 30. Advance Peace is also designed to save cities money. Boggan says the cost of one homicide is far greater than what the program costs in full for five years. A study from Iowa State University using data from 2003 found a homicide on average costs society $17.25 million if you consider the financial impact to the family, the government, the courts, the hospital, the police department, and more. A 2010 study by the RAND Corporation, a nonprofit research center, found the cost averages around $8.5 million. Although it’s up to the council to vote Advance Peace in, law enforcement is an important supporter to gain. Boggan says the decrease in gun violence Richmond has seen is attributed to law enforcement and other community organizations all working together. Dyer says he is “more than willing” to work with organizations like Advance Peace that have a common goal of reducing violence and working with gang members to leave their lifestyle. “As long as that’s their true motive and their motive is not driven by money because I have seen over the years there are far too many organizations that are in it for the wrong reasons where they begin to chase the money,” Dyer says. Street Saints is an organization the police department works with, Dyer says, that offers youth programs and gang prevention and intervention. He says the police department has also paid former gang members to go out to homicide scenes and try to help prevent future shootings. The last two years, Fresno has seen a reduction in shootings, Dyer says, but that’s not to say there isn’t a lot of work to do. There are about 100 different gangs and 20,000 gang members in Fresno, he says, and about 10 percent of those gang members are the most active. Foster says Fresno needs Advance Peace because many people affected by fatal shootings don’t see any other way of dealing with their grief besides picking up a gun. “Our culture tells us to retaliate and avenge murder,” Foster says. “We don’t know how to deal with death in any other way. My favorite saying is, it’s easier to take peanut butter off of bread than to tell one of these young men not to avenge their fallen friends. Advance Peace and local groups are expected to meet with the mayor and Dyer later this week in hopes of gaining their support.